"I can this soup mixture (before adding the butter, flour and milk) about every other year. You determine how much you do at one time. I usually put up about 80 jars at a time, mostly in October when the weather has cooled down." In a small saucepan over medium heat, melt butter. Whisk in flour all at once to form a roux, cook 1 minute. Whisk in milk, a little at a time, cooking and stirring constantly until thickened. Stir into tomato mixture and heat through. 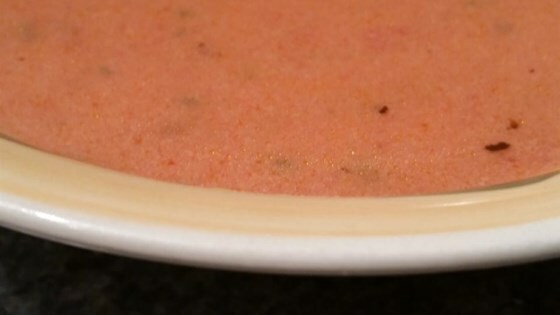 Creamy tomato soup with roasted chicken. I love, love this recipe! I do not have a food mill, so I peeled and seeded the tomatoes, then used my hand blender to puree. So good, thank-you!